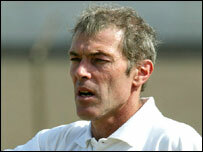 Frenchman Michel Dussuyer may have his contract as the national coach of Guinea extended when it expires on 4 March. Fode Capi Camara, the secretary general of the Guinea Football Federation (FGF), has said the FGF is satisfied with the coach's performance since he took over the Syli Nationale in September 2002. "We are happy with Dussuyer as he has been able to improve the standard of our national team by taking us to the quarter-final stage of the Nations Cup," Camara told BBC Sport in the Guinean capital Conakry. Guinea reached the last eight of the Nations Cup after finishing second in Group A, before losing 2-1 to Mali in a tight quarter-final. Although Dussuyer produced the right performances from his players on the field, Camara explained that there were some other areas where the French coach could improve. "The only problem we had with Dussuyer during the Nations Cup was that he was not able to control some players in the camp and we need to talk to him about that." Dussuyer returned to France following Guinea's Nations Cup exit and is due to arrive in Conakry on 28 February to have talks with the FGF about a possible contract extension. The French coach revealed to the BBC during Tunisia 2004 that he would like to continue his job with the Syli Nationale. If Dussuyer does have his contact extended, his first task will be to prepare Guinea for the 2006 World Cup and Nations Cup qualifying match against Kenya in Nairobi on 4 June. Guinea are in Group 5 along with Morocco, Tunisia, Botswana and Malawi.